Perennial. Zone 1. Asparagaceae, formerly Liliaceae. Woodland flower of Northern Europe, from England east and south to the Caucasus, into northern Turkey. Also found in Japan, and the North American Appalachians, though there is some speculation that the American population originated from introduced plants. Lily-of-the-Valley has been grown in gardens since at least 1000 B.C. It is well documented in many herbals and plant lists, and was an important medicinal herb as well as a highly-regarded ornamental. Today most of its uses are decorative, though the species’ chemical constituents are being studied for various medicinal applications, and it is used in homeopathy as a remedy for various heart conditions. 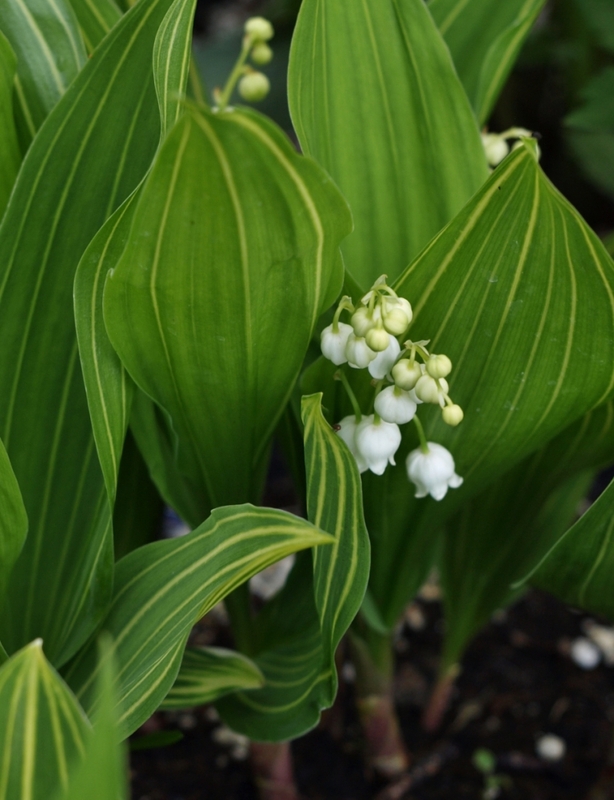 By mid to late April in Cariboo-Chilcotin garden, the tightly furled spikes of Lily-of-the-Valley start to emerge, soon unfolding into dark green, mule-ear shaped leaves, with the bloom clusters visible at the base of each foliage cluster. As May progresses the leaves expand to form a solid carpet of green, and the bloom stems lengthen, until one long-anticipated day one becomes aware, by catching a waft of the unmistakable fragrance, that the first flowers have opened. The blooms are pristinely perfect: tiny pure white bells with pale yellow stamens, arranged in gently arching sprays. Thickly textured and long lasting, these are marvelous cut flowers, being free of their fragrance even after several days in a vase. Lilies-of-the-Valley are classic wedding bouquet flowers, and are commercially grown for the specialty florist market, though brides in months other than when the plants naturally flower should be prepared to pay a premium price for the artificially-forced greenhouse-grown blooms, which will also not be as fragrant as their garden-grown counterparts. In the Victorian “Language of Flowers”, Lily-of-the-Valley signified “return to happiness” and “expectation of love”, which, along with the delicate virginal beauty of the blooms, no doubt accounts for its many bridal associations. The fragrance of the flowers is outstanding, and perfumers have tried for centuries to mimic it in their concoctions, for though it is freely produced, it is not able to be captured in any sort of usable way. Reasonable imitations have been produced chemically, but there is truly nothing like the real thing, from a cluster of the dew-wet blooms picked on a fresh May morning. To grow your own plot of Convallaria, you should first prepare a patch of shady ground by removing all surface tree and shrub roots and potentially competing grasses and other plants, and then digging in some well-rotted compost or manure. Plant the shallow-rooted pips just as they come out of their pots, with the rhizomes extending at right angles from the leaf clusters. Keep well watered and weeded the first season, and after that the plants should settle in to form an ever-expanding, maintenance-free colony. Lily-of-the-Valley does very well under trees and high-pruned shrubs, thriving on the filtered sunlight coming through leaves. Though very shade tolerant, plants do need some natural light if they are to bloom, so avoid dense shade such as that on the north side of buildings. Also avoid planting these in the mixed border, as they are happier where they can form a single-species colony. Very vigorous larger plants will crowd them out, and they in turn will gobble up more delicate things; the ongoing struggle will not be a happy thing, so it’s best to dedicate an area to your plantation right from the start. Many people inquire as to the poisonous aspects of this plant, as it does appear on many “toxic garden flower” lists. Though all parts of the plant contain cardiac-affecting glycosides and digestive system-affecting saponins, though there are very few confirmed cases of actual poisonings, and no confirmed fatalities. It is theorized that, though potentially dangerous, the chemical constituents in the fresh plant matter are poorly absorbed by the digestive tract, so though accidental consumption might make you feel quite sick, it probably won’t kill you. (And I can’t imagine why one would accidentally consume this plant, as it is quite distinctive and not likely to be mistaken for anything else during any stages of its growth.) The plants frequently produce red berries in the summer and autumn and this may be of some concern to those with very young children; be aware and garden with this in mind. There are a number of interesting variations of this venerable garden plant occasionally available at specialty nurseries. We are in the process of propagating our own small colony of the striped-leaved variety, Convallaria majalis ‘striata’, and hope to be able to share these in a few more years. There is also a rosy-pink variation, Convallaria majalis ‘rosea’, and a double type, Convallaria majalis ‘prolificans’, though these last two are much less vigorous than their ancestors.